SEGRID (Security for Smart Electricity GRIDs )is a collaboration project, funded by the EU under the FP7 program. SEGRID partners are DSO’s Manufacturers, knowledge institutions and universities. SEGRID’s main objective is to enhance the protection of smart grids against cyber-attacks. We do this by applying a risk management analysis approach to a number of smart grid use cases (the SEGRID use cases), which will define security requirements and determine gaps in current security technologies, standards and regulations. The identified gaps and the analysis itself will give input to the enhancement of risk assessment methodologies and the development and testing of novel security measures for smart grids. SEGRID has 7 Workpackages as shown in the picture below. The SEGRID use cases will serve as a abasis for the project. 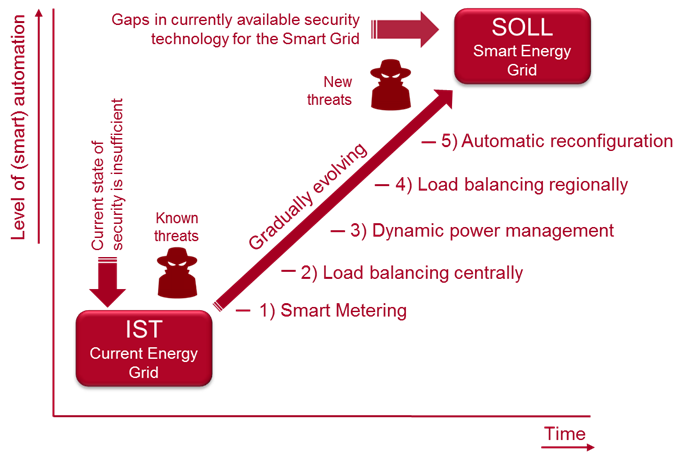 The use cases reflect the growing complexity of the smart grid in the coming years, as shown in the picture below.